Guest post by the husband. Note from Carrie: I married someone who liked to read. I couldn't imagine not doing so. It turned out well. I loved him and he read. It was like a type of perfection. At any rate, you may see a post from him every now and again. Here's the first. By way of introduction: I'm Jonathan, husband to Carrie, and although I unfortunately have much less opportunity to read than she does I still enjoy it very much. Safely Home was a book she recommended to me some time ago, and it did not disappoint! The story is built around the journey (in a physical and spiritual sense) of Ben Fielding, a successful American businessman, intending to spend some time in China to develop a more international presence for his corporation. He opts to look up his old Harvard roommate, Li Quan (a native of China), to see about lodging with him during the trip, despite having not communicated much with him for many years. 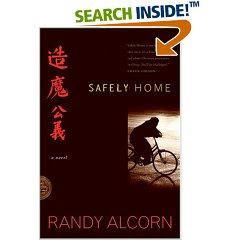 Quan greets him with open arms and invites him to stay in their home (or, more accurately, hovel), and in doing so introduces the unsuspecting Fielding to life as a member of the underground Christian church in China. Ben Fielding approaches life with many of the assumptions common amongst Americans --that religious tolerance is ubiquitous and that people around the world have the liberty to pursue whatever beliefs they like. But, for himself, a safe agnosticism hiding behind a moderately Christian code of ethics is enough. Suffice to say that Christians in China are persecuted in every way imaginable. They are refused jobs and social standing. It's flagrantly illegal to teach Christianity to a child under 18, to meet with other believers in a non-government-authorized church (and those are few to be found), or to possess unauthorized reading materials (i.e. the Bible, to start with.) Offenses are met with imprisonment, torture, even death. I'll not describe much more of the plot, but will leave that to be discovered upon reading the book. It's excellent. What I will say is that, upon finishing Safely Home and having some time to consider the spiritual issues it raises, I believe this: That as shocked as I am at the inhuman treatment of Christians by the Chinese government, I believe members of the underground Christian church there would be equally shocked to discover how easily we, as Christians in America, treat our faith with a cavalier attitude and allow it to slip by the wayside. The persecution they experience draws them closer to each other and to God, and builds a faith of greater capacity than we can imagine. Meanwhile, we allow ourselves to be lulled by a much more subtly anti-Christian government into the idea that one's religious beliefs are simply abstract thoughts which need not play a role in our daily choices and actions. We must strive to recognize the spiritual warfare taking place in our own neighborhoods and workplaces, as easily as it can be observed in an oppressive country like China. The prince of this world may vary his strategy against Christians from country to country, and it does us good to open our eyes to its reality. I really *loved* this book when I read it, a few years ago. Somehow we gave away several copies of it, and now our own shelves lack it. :( I've been aching to reread it. This is one of my favorite books! My husband bought it for me (at my request) for mother's day a few years ago. I have since loaned it out and not gotten it back - the true hallmark of a great book (or lazy people, but we won't get into that). I need to buy a new copy sometime soon. Another one I also read and enjoyed immensely! I've never read Alcorn, but this review makes me want to. I feel skeptical that anyone could write about Heaven, but I should put the assumption to the test and see how Alcorn does it!